Every other year, the Dignity & Respect Campaign recognizes a National Champion. The individual embraces and embodies the values of dignity and respect, demonstrates and recognizes life-long commitment to social issues and a commitment to making the world a better place for all to live—with all of our differences. 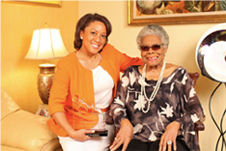 Dr. Maya Angelou—celebrated poet, memoirist, novelist, educator, dramatist, producer, actress, historian, filmmaker, and civil rights activist—was honored as the inaugural National Dignity & Respect Champion. 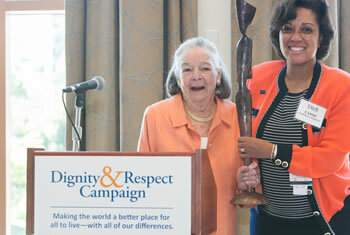 She exemplified and defined the characteristics of a Dignity & Respect Champion. Elsie Hillman—an American civic and political leader, philanthropist and activist, was the 2013 National Dignity & Respect Champion. She has contributed leadership and support to advance the quality of life and equity for all citizens. Dr. Johnnetta B. Cole—an American anthropologist, educator, President of two historically Black colleges for women, and museum director, was the 2015 National Dignity & Respect Champion. She has been an advocate for education, diversity and inclusion, and equality for people.